Huntington Public Library has joined with LILRC (Long Island Library Resources Council) and other libraries throughout Long Island in digitizing items of local historical interest. Visit Long Island Memories and explore Huntington and other Long Island libraries' array of unique resources. The digital collection contains old historical documents, photographs, postcards, rare books, newspapers and more. 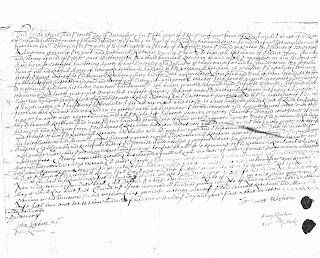 Below is a scanned image of an original Land Deed between Samuel Ketcham and Nathaniel Ketcham from December 10, 1704. The deed refers to land in Huntington, the easternmost purchase on "half hallow hills." It's a sample from a three volume set of original documents entitled Long Island Documents, compiled in 1938 by Dr. Theodore Lyman Frost, librarian of the Huntington Public Library. Long Island Memories is an ongoing project, so check back often for new additions to the digital collection.